I went up to visit Miss B at her new apartment this weekend. While visiting she mentioned that her desk area was quickly becoming cluttered with law books, papers, etc. She has amble closet space at the apartment, so we googled home office in a closet and got these pictures of ideas. This was my favorite, but she can't wall paper so it was out. This was also nice because of the color and lightening. Off to IKEA we went to look at possible ideas. Miss B did not like the orange, but this was a good temporary setup for the closet because you could take it with you at the end of the lease. This fold down top was nice because of the work area it created. already exist in the closet. traditional and Miss B likes contemporary. I especially liked the mini-lamps inside. We got some good ideas. I'll keep you posted on the progress. I've just completed an office redo and am fortunate to have a room. 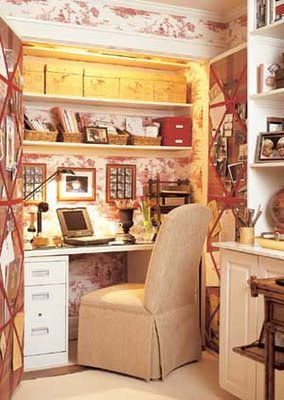 But I love the idea of using the closet space for an office! What does Mr. B think out the additional work for him? I bet he would do anything for Miss B. Good Luck and I can't wait to see what you end up doing.